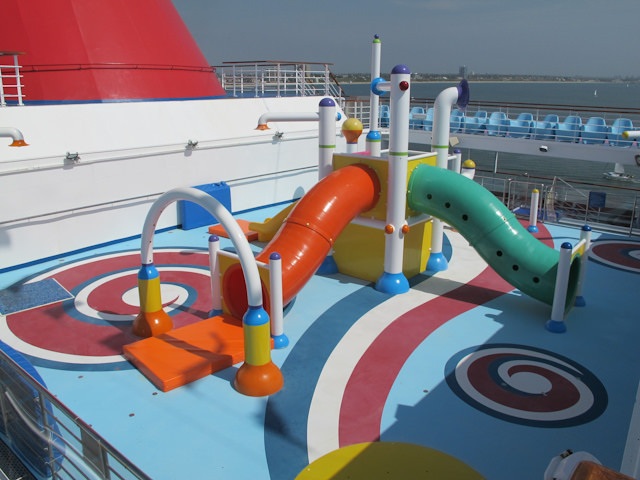 Launched in 2008 and slightly larger than Carnival’s earlier Conquest-class ships, the 113,000-ton 3,006-passenger Carnival Splendor is just as bright and playful, but with a few tweaks, including a larger playroom and a great water “sprayground” up on deck. 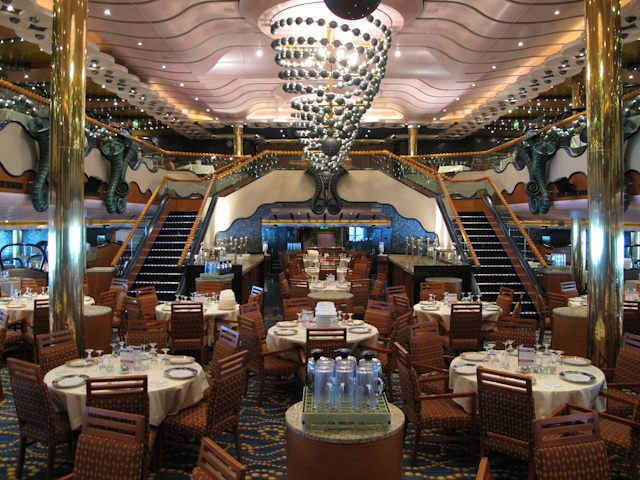 The glittery nine-deck-high atrium is anchored with a bar and is a great place to meet or people watch. 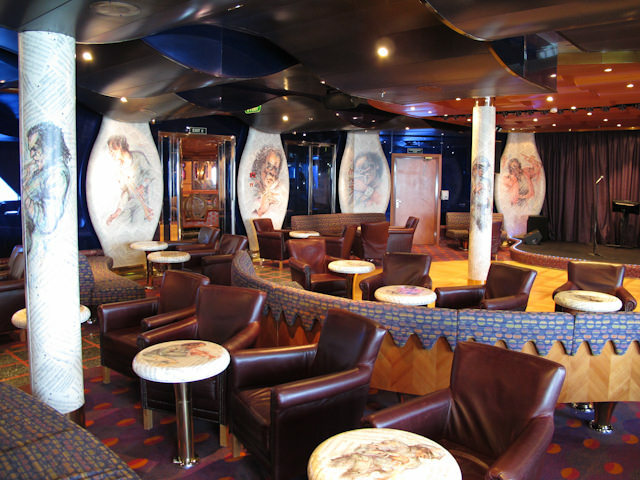 In all, there are 22 bars and lounges that play off the ship’s “splendid things” theme, from a sports bar with famous stadiums displayed in glass cases to the Red Carpet disco covered in deep red hues, with mannequins waiting in line behind a classic velvet rope. There’s a piano bar, jazz club and the El Mojito promenade bar that mimics an Old Havana café with Spanish-style columns, lanterns and terracotta floors. The casino packs in almost 300 slot machines and about two dozen gaming tables. The three-level theater is the venue for pull-out-the-stops Vegas-style song and dance productions accompanied by live orchestras. Dining options include a pair of two-story main restaurants as well as an intimate, extra-cost steakhouse serving USDA prime aged steaks and seafood for a mostly adult clientele looking for a more upscale experience. Meals are also served in the two-story lido buffet where you’ll find separate stations for Asian and American dishes, deli sandwiches, salads, pizza, burgers and more—not to mention a replica of the Statue of Liberty. The ship’s four swimming pools include the main pool flanked by a pair of huge hot tubs, a stage for live (and really loud) music, and a giant movie screen for videos and ship events. A 3-deck-high spiral water slide takes thrill-seekers on a 214-foot-long ride. For young kids, there’s a great water park with sprinklers and sliding boards. The 5,500 square-foot Children’s World playroom has an arts-and-crafts station, video wall, computer lab, PlayStation games, and lots of toys for younger children. Hard-to-please tweens have their own separate space and so do teens, theirs with a soda bar and dance floor flowing into a huge video game arcade with air-hockey tables which is open to all passengers. Kid of all ages can have a zap-fest in the inflatable laser tag arena. Splendor’s standard outside cabins measure a roomy 185 to 220 square feet, and offer amenities like stocked, pay-as-you-go minifridges, robes to use while on board, and super-comfortable mattresses and bedding. Sixty-eight special spa staterooms feature Asian decor and private elevator access to the spa. I AM SO DISGUSTED WITH CARNIVAL CRUISE LINES !!!!! I HAVE BEEN A DEDICATED CUSTOMER OF THEIRS FOR 20+ YEARS GOING ON 2-4 CRUISES PER YEAR. THEY JUST LOST A CUSTOMER. 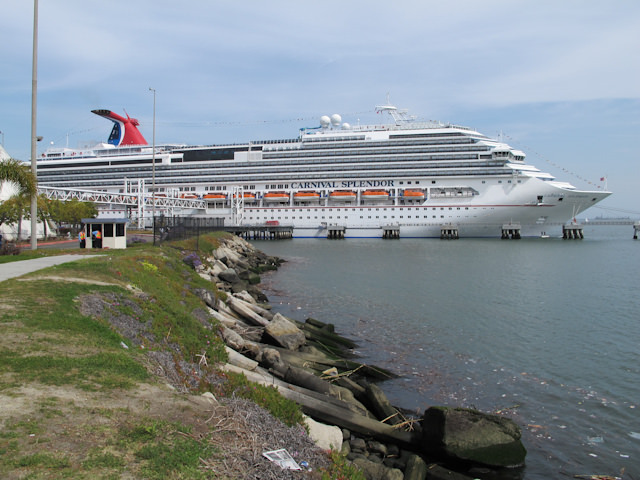 MY HONEYMOON CRUISE WE TOOK CAREFUL CONSIDERATION TO SELECT AN EASTERN CARRIBBEAN CRUISE EVEN THOUGH WE DIDN’T REALLY WANT TO DRIVE TO THE SOUTH FLORIDA PORT. DAYS PRIOR TO SAILING I LEARNED THEY TOTALLY CHANGED THE ITINERARY TO A WESTERN CARRIBBEAN ITINERARY THAT IS USUALLY MUCH CHEAPER WITHOUT ANY OPTIONS GIVEN TO THEIR CUSTOMERS. I CALLED ABOUT IT AND ASKED FOR SOME TYPE OF UPGRADE ON THE CABIN TO COMPENSATE OR ANYTHING AT ALL. THEIR ANSWER WAS “NO”. THEY HAVE RUINED MY HONEYMOON EXPERIENCE BY CHANGING THE ITINERARY TO WHAT I CONSIDER A CRAP ONE I WOULD NEVER HAVE CHOSEN AND NO COMP FOR IT AT ALL. I WILL TAKE MY BUSINESS ELSEWHERE FOR THE REST OF MY TRAVEL.